For the month as a whole, central and southern coastal areas were wettest, with seven observing stations receiving over 6.00". This included Lacey Township (Ocean County) with 6.65", followed by Estell Manor (Atlantic) 6.35", Upper Township (Cape May) 6.27", and Pine Beach (Ocean) 6.14". Lowest totals were scattered in central and northern areas, with Medford Township (Burlington) at 3.46", Glen Rock (Bergen) 3.68", Bernards Township (Somerset) 3.90", and Parsippany-Troy Hills (Morris) 3.92". 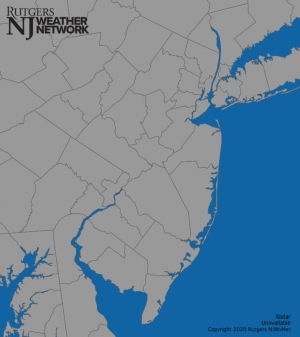 Of the approximately 150 NJ CoCoRaHS and 55 NJ Weather and Climate Network stations with complete or nearly complete daily records, most received between 4.00" and 4.99" of precipitation, while about 40 caught 5.00"-5.99". There were seven precipitation events worthy of note in December. The first included scattered rain from the 5th to early on the 7th, with the heaviest falling on the evening of the 6th into the 7th. This statewide soaking saw as much as 1.37" and 1.35" at two Readington Township (Hunterdon) stations. 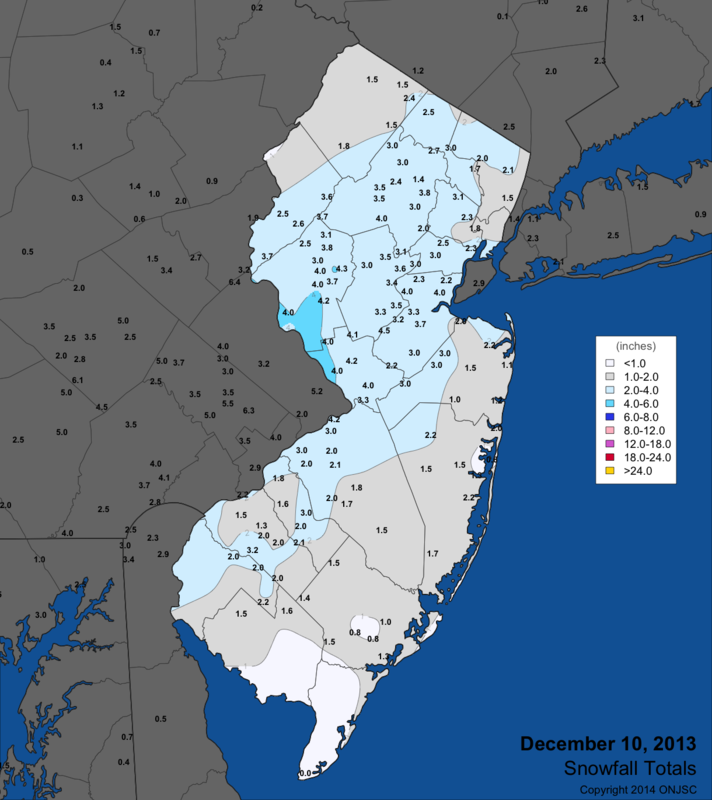 The northern half of NJ received over an inch, while 0.50"-1.00" totals were common in the south. Reports of thunder at dawn on the 6th were received from observers in the Cape May County communities of Woodbine and Sea Isle City. 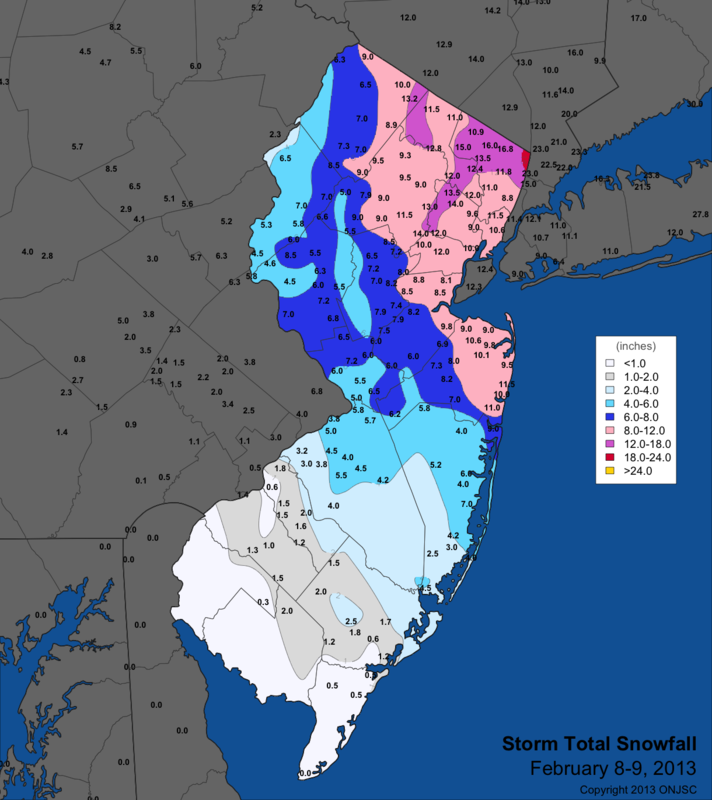 The next event occurred on Sunday the 8th, when portions of south Jersey were quickly smothered with about as much of the white stuff as what fell all of last winter. If you tapped your barometer, you would have noted quite high pressures, certainly not indicative of a storm. However abundant moisture converged along a frontal boundary and was subsequently lifted and quickly fell to the ground as heavy snow in roughly a 20-mile wide band from the southwest to the central coast. Totals within this zone were as high as 9.5" in West Deptford (Gloucester), Medford (Burlington) 9.4", Southampton Township (Burlington) 9.3", Laurel Springs (Camden) 8.3", Berkeley Township (Ocean) 7.1"-9.5" (3 reports), and Pittsgrove (Salem) 6.0-7.5" (2 reports). Less than an inch fell to the south in Cape May County, as well as from Hunterdon, Somerset, and Middlesex counties northward. 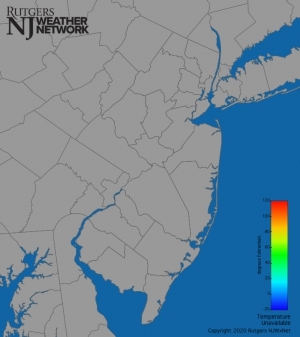 The rain and snow water equivalent from this event was as high as 2.15" in Lacey Township (Ocean), 1.99" at Wildwood Crest (Cape May), and 1.93" in Woodbine (Cape May). Next up was a weak area of low pressure that moved through NJ along an arctic front on the 10th. This brought a light to moderate snowfall across most of the state, with totals ranging from 4.5" in South Brunswick (Middlesex), 4.3" in both Long Hill (Morris) and White House Station (Hunterdon), 4.2" in Florence (Burlington), 3.5-4.2" in Flemington (Hunterdon; 3 reports), and 3.0"-4.2" in Lawrence Township (Mercer; 2 reports) to a trace in Cape May County. Rain and melted snow amounted to as much as 0.58" in Sea Isle City (Cape May), 0.43" at Robbinsville (Mercer), and 0.42" in Lawrence Township. A more powerful winter storm arrived on the weekend of the 14th-15th. Energy from a low-pressure system coming out of the central US was handed off to a developing low along the mid-Atlantic coast. The resulting storm brought rain, freezing rain, sleet, and snow that melted down to as much as 2.34" in Eatontown (Monmouth) and 1.84" in Ocean Township (Monmouth) to the lowest total of 0.41" in Hamilton (Mercer). Mostly rain fell in the south, with a mix of snow, sleet, and freezing rain elsewhere. Snow totals were as high as 9.3" in Sussex (Sussex), 6.5"-8.1" in Blairstown (Warren; 4 reports), and 7.0" in Oakland (Bergen), Wantage (Sussex), Lake Hopatcong (Morris), Asbury (Warren), and Belvidere (Warren). Little to at most a few tenths of an inch of frozen precipitation fell from Ocean, Atlantic, and Gloucester counties down to Cape May. Several tenths of an inch of ice accumulated on trees, wires, roads, and other surfaces from the southwest into central counties. A remarkable range of temperatures exceeding 40° developed across NJ during the afternoon and evening of the 14th as an arctic boundary was draped from the southwest to northeast corners of NJ. To the north, temperatures stayed below freezing and were as low as 8° at High Point Monument (Sussex). Meanwhile, it warmed to 56° in Dennis Township (Cape May). The map below from late evening shows a range from 55° to 13°, typical of this event. The fourth and final punch in this unusual early-season wintry four-round bout occurred on the 17th. An Alberta Clipper system arrived from western Canada during the pre-dawn hours and deposited a nuisance inch or less of snow. A few additional shots of light precipitation (rain, freezing rain, or snow) during the day led to final tallies of as much as 3.5" in Bethlehem Township (Hunterdon), 3.2" at West Milford (Passaic), and 3.0" in Butler (Morris), Marcella (Morris), Highland Lakes (Sussex), and Bernards Township (Somerset). The southern half of NJ went snow free and had less than 0.10" of rain. Northern areas only saw a liquid equivalent of a few tenths of an inch. Much like the previous event, there was an enormous range of temperatures across NJ during the afternoon, as seen at mid day when temperatures ranged from 53° in Cape May Courthouse (Cape May) to 13° at High Point Monument. Two statewide soaking rain events occurred at month's end. The first from the pre-dawn hours to early evening of the 23rd brought 0.50" to almost an inch to all but the southern coast, where only a few tenths fell. Greenwich Township (Warren) topped the list with 0.97", followed by Millstone (Monmouth) with 0.94" and Bethlehem Township (Hunterdon) with 0.93". A more formidable nor'easter from the morning to evening hours of the 29th deposited over an inch of rain throughout most of NJ. Only the far southeast and northwest received just under an inch. Top totals were along the northern coast and included Berkeley Township (Ocean) 1.84" and two Stafford Township (Ocean) readings of 1.42" and 1.60". With the four key snow events, and scattered snow showers on days that included Christmas Eve and New Years Eve, there was an even distribution of above-average December snow across NJ. Northern counties averaged 10.6", the central section 9.4", and the south 8.3". These are respectively 3.9", 3.8", and 4.7" above normal. At 16.2" for the month, Bethlehem Township (Hunterdon) received the most snowfall. This was followed by 14.2" in Flemington (Hunterdon), 13.8" in Hackettstown (Warren), and 13.5" at Medford Lakes (Burlington). Cape May County saw less than an inch, with 0.3" in both Woodbine and Middle Township and 0.4" at Wildwood Crest. The 9.2" statewide average was well below the five snowiest Decembers on record, which include 21.9" in 1904, 17.4" in 1960, 16.7" in 1966, and identical 15.1" totals in 2009 and 2010. An inch or more of snow covered the northern half of NJ for as much as two weeks, something rather unusual for December. For instance in New Brunswick (Middlesex) the 12 days of an inch or more of cover tied with 1948 for the 3rd most number of days over the past 100 Decembers. Only 1960 with 19 days and 1995 with 13 days had more. The average is just over 2 days. Wind gusts topped 40 mph on four December days. On the 6th, Wantage (Sussex) peaked at 41 mph. The 22nd was the windiest day, with Cream Ridge (Monmouth) up to 43 mph, Berkeley Township (Ocean) to 41 mph, and 20 NJWxNet stations gusting to 30-39 mph. High Point Monument (Sussex) gusted to 41 mph on the 25th and the 29th brought gusts of 50 mph to Atlantic City Marina (Atlantic), 44 mph to Harvey Cedars (Ocean), 43 mph to Woodbine (Cape May), and 40 mph at High Point Monument. Eight other stations gusted in the 30-39 mph range. The barometer topped out near 30.60" on the 8th and was as low 29.40" on the 29th. Six December days had one or more stations within the NJWxNet with maximum temperatures of 60° or higher. Eight other days saw a maximum somewhere in NJ between 55°-59°. Howell (Monmouth) peaked at 63° on the 5th, with 62° at both Berkeley Township and Toms River in Ocean County. Woodbine (Cape May) reached 65° on the 6th, with nine locations up to 63°. Record or near-record warmth enveloped NJ from the 21st to 23rd. Woodbine hit 71° on the 21st, with Greenwich (Cumberland) and Howell at 70°. One of the warmest late December days ever observed in NJ occurred on the 22nd, with Woodbine, Toms River, and Berkeley Township sharing top honors at 73°. Maximum temperatures reached from 70° to 72° at 22 NJWxNet stations. Only High Point Monument (Sussex), Hope (Warren), and Harvey Cedars (Ocean) managed to stay out of at least the 60°s, with all three locations reaching 59°. Early morning temperatures on the 22nd were in the 60°s at a number of locations, already having established daily records. A full assessment has yet to be completed, but it may be that low temperatures on the 22nd were the highest, if not close to the highest on record for Decembers over the past century. Some 14 stations failed to fall below 60°- 63° the entire day. The warmth continued into the 23rd, when Hammonton (Atlantic) reached 65° and 11 other locations were 64°. Making this warm spell all the more remarkable was the fact that on the morning of the 17th temperatures across the state were as low as -1° in Walpack (Sussex). This location topped out at 64° on the 22nd. Whether you look at the 73° temperature swing within NJ over the course of five days or the 65° difference just at Walpack one cannot help but be impressed. And with this, the entire snow-covered central and northern portions of the state reverted to early winter brown...lousy timing when it comes to hoping for a white Christmas. Exploring the cold days of December 2014, not once did every location in the state remain below freezing all day long. However West Cape May (Cape May) at 36° was the only location above freezing on the 12th, and only a dozen stations rose to between 33°-35° on Christmas Day. Meanwhile High Point Monument failed to crack the freezing mark on 17 December days, only making it to 17° on the 12th. Minimum temperatures fell into the single digits or lower at one or more locations on nine days. 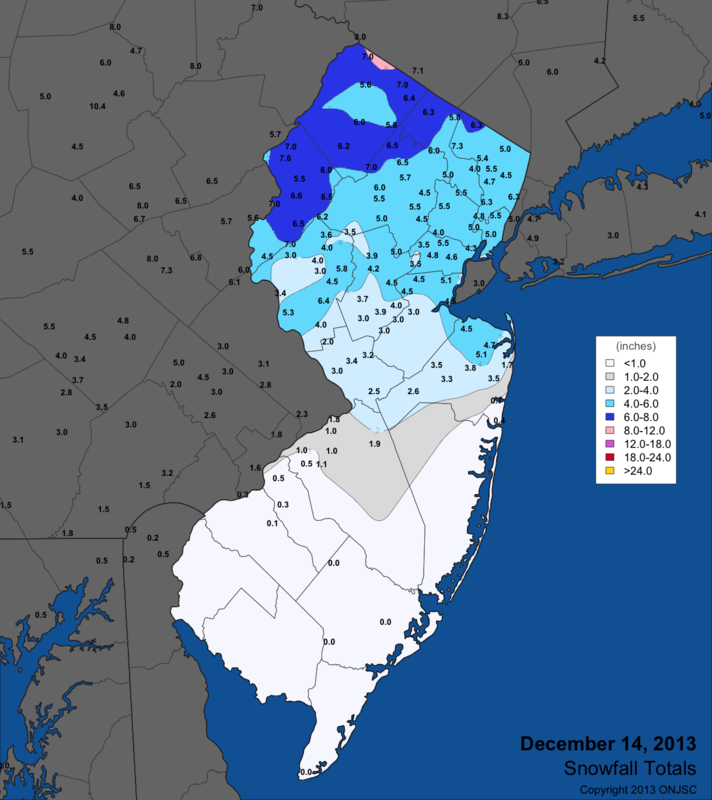 The 12th saw lows of 5° at Walpack and 8° in Kingwood (Hunterdon), High Point (Sussex), and Berkeley Township (Ocean). Walpack and Pequest (Warren) fell to 6° on the 13th and the High Point Monument and High Point stations were at 8° and 9°, respectively, on the 14th (the High Point station is 370 feet lower than the Monument site). Walpack reached 1° on the 16th, when Pequest and Kingwood were both at 6°. The first of consecutive day -1° minimums occurred at Walpack on the 17th. This was the coldest day of the month statewide, with eight stations between 5° and 9°, although West Cape May only fell to 31°. In addition to Walpack's -1° on the 18th, Pequest reached 0°. The 19th saw Walpack and Pequest both at 6°. High Point Monument and High Point bottomed out at 7° and 8°, respectively, on the 25th, and the Monument station was as cold as 9° on the 31st. The statewide 2013 average temperature of 53.3° was 0.1° above the 1981-2010 average and 1.0° higher than the 1895-2012 average. This tied with four other years as the 22nd warmest year on record. Seven months saw temperatures above average, including July, which was the 5th warmest on record. The hottest day of the year was the 19th, when Harrison (Hudson) soared to 102°. The coldest day was January 24th, when Walpack (Sussex) fell to -4°. Precipitation (rain and melted snow) totaled 47.84" for the year statewide. This is 0.90" above the 1981-2010 average and 2.54" greater than the 1895-2012 average. This ranks as the 42nd wettest year of the past 119. The wettest event of the year was the statewide average 3.31" associated with Tropical Storm Andrea in what was a record wet June. Fall was marked by dry conditions, especially in northern and central counties. Listed below is the Office of the NJ State Climatologist's ranking of the top 10 weather and climate events of 2013. More about each event can be found in the monthly narratives posted on njclimate.org. You might be tempted to rearrange the rankings, particular as some of the events may have affected you more than others ahead of them on the list. That's the enjoyment of lists. While it wasn't the most eventful of years for NJ weather and climate (goodness, we needed a breather after 2011 and 2012), there was still plenty to talk about. 1. 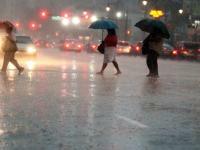 Tropical Storm Andrea delivers a statewide average of 3.31" of rainfall. a. 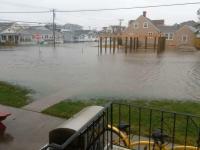 Maximum rainfall of 7.72" at Toms River (Ocean County). b. Wind and freshwater and coastal flooding were not major issues. 2. Statewide, the wettest June on record. a. Based on 119 years of record back to 1895.
b. The 9.58" total is 5.56" above 1981-2010 average. c. Contributed to the 4th wettest summer. At 19.52", summer rainfall was 6.78" above the 1981-2010 average, but far behind the record maximum in 2011 when 24.25" fell. 3. Statewide, the 5th hottest July on record. b. 2010 and 2011 Julys were hotter and 2012 was only 0.1° cooler. c. Warmest monthly minimum of any month on record, some 1.8° above the previous record high minimum in July 1955.
d. Excessive levels of humidity were quite common. e. Contributed to the 14th hottest summer (Jun-Aug) on record since 1895, yet it was the least hot since 2009 and the 9th least hot since 1998. 4. February 8th-9th snowstorm sideswipes NJ but still produces greater than 10.0" snowfall totals in northeastern NJ (see map here). a. Maximum snowfall of 16.8" in River Vale (Bergen). b. An inch or more fell in every county except Salem and Cape May counties. c. 4.0" or more fell in all or portions of every county from Burlington and Ocean northward. d. 10.0" or more fell in all or portions of eight counties. 5. Dry fall (September-November) in central and northern portions of NJ. a. The northern tier of counties placed in the D1 category (moderate drought, only expected once every 5 to 10 years) in the US Drought Monitor. b. The 2.98" that fell in Franklin Township (Somerset) between September 4thand November 25th was approximately 8.00" below or 25% of average. 6. Hit and miss July downpours. a. 14.08" fell in Mt. Holly (Burlington), yet just 30 miles to the east only 1.55" accumulated in Lacey Township (Ocean). b. 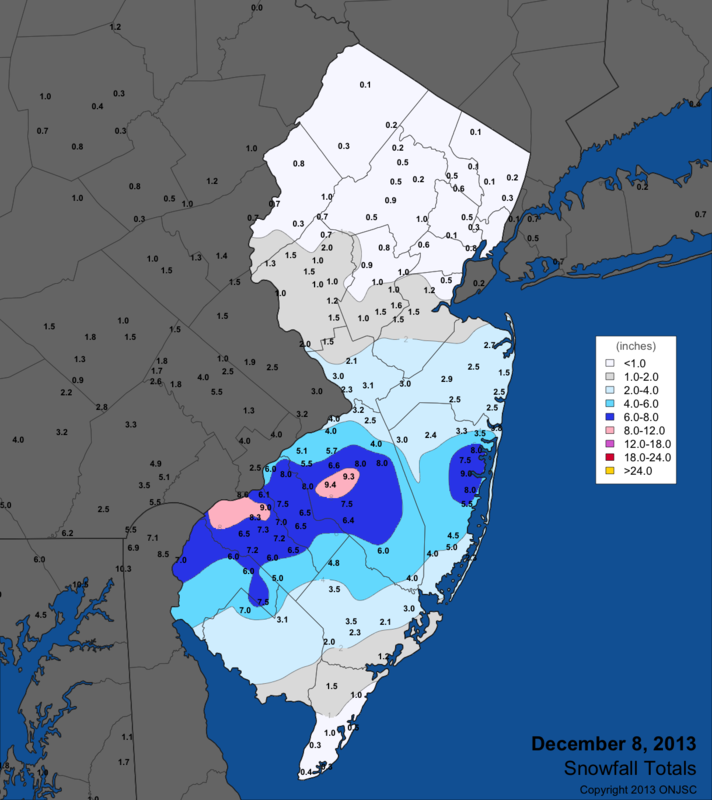 9.00" or more fell in at least one location in Burlington, Camden, Hunterdon, Ocean, and Salem counties. c. Less than 3.00" fell in at least one location in Atlantic, Bergen, Cape May, Monmouth, and Ocean counties. 7. 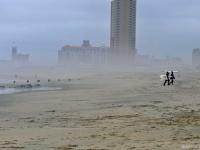 South Jersey October nor'easter (associated with the remnants of Tropical Storm Karen). a. Harvey Cedars (Ocean) received wind gusts of at least 30 mph for 79 consecutive hours from the 9th-12th, and at least 25 mph for 109 consecutive hours. Peak gust was 43 mph. b. Maximum rainfall was 3.74" at Middle Township (Cape May). c. Minor to locally moderate coastal flooding. 8. 10th consecutive year with the annual statewide average temperature above the 1895-2013 average. a. Average of 53.3° is 1.0° above the period of record average and 0.1° above the 1981-2010 average. b. 26 of past 31 years have had above-average annual temperatures. 9. Three minor tornadoes touch down. a. Including an EF0 twister on July 1st in Union County EF0, an EF0 on August 13th in Ocean County, and an EF1 on October 7th in Bergen County. b. No injuries were reported in any of the tornados. 10. 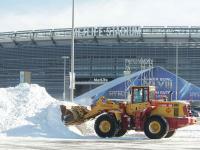 Four early December snow events bring out the plows in various areas. e. Statewide monthly snowfall: 9.2", which is 4.3" above average. - Coldest week since 2007 during January 21st-27th, including the 22nd-26th when no location in NJ exceeded 31°. - March 2013 statewide average temperature 2.6° below 1981-2010 average. This is 11.3° milder than March 2012. - Only four August afternoons saw maximum temperatures of at least 90°, and these just occurred at several scattered locations. - 30 mph wind gusts fanned a boardwalk fire at Seaside Heights on September 12th, while flash flooding occurred in southern Passaic and western Bergen counties. As much as 3.71" fell in Hawthorne (Passaic). - A 103-day difference in growing season length (days between last spring freeze and first fall freeze) across NJ, with 119 days at Walpack (Sussex; May 28 - September 23) to 222 at Atlantic City Marina (Atlantic; April 5 - November 12). - Average monthly temperature below average for five months. The highest number of below-average months since seven in 2009.